I established my practice in 1997 as I am a native of Fort Wayne and wanted to raise my family here. Fort Wayne is a great place to live and practice. We use a variety of different techniques to get the best results for our patients. Family practice is the most rewarding for me….being able to treat the whole family with both chiropractic as well as Standard Process nutrition and seeing the results that I can achieve is the biggest reward of all! Our mission is to deliver honest, ethical and superior chiropractic care at a fair price to our community. My ideal patient is able to think outside the box…just a little….and see the great common sense benefits of getting adjusted on a regular basis. Those patients who come in with an open mind and a willingness to learn and to get well will do just that! What is the cracking sound that I hear when you adjust my neck? The cracking sound is just gas being released from the joint. It is no different from when you crack your knuckles and has no bearing on the effectiveness of the adjustment. I would like to see the citizens of my community use common sense in their health care choices and not rely on the medical model exclusively. When they are sick, most people go into fear mode and run to the MD first….sometimes that is the right choice but too often it is not. I always tell patients, know in advance what your doctor is going to recommend before you go into the office. Most people understand that the medical doctor recommends drugs or surgery….”is this what you want, Mr. Patient?” If not, pick a doctor that can give you want you want. Chiropractors offer very effective options to drugs and surgery and their inherent side effects. Sound interesting? 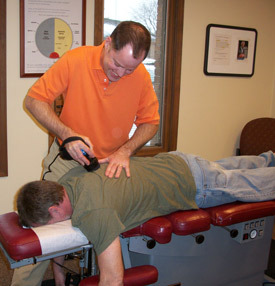 Please contact our Fort Wayne chiropractic practice to make an appointment.